Emack & Bolio’s is a multi-award-winning ice cream store that began in Boston, United States in 1975. It was founded by Bob Rook, a lawyer and self-declared hippie who has worked closely with the homeless, anti-war demonstrators, civil and gay rights advocates, and numerous rock bands such as Aerosmith, U2, Boston, The Cars, and James Brown. There are now stores across the USA, Thailand and the UAE, and we proudly opened the first store in Hong Kong in October 2015 (with more to come!). 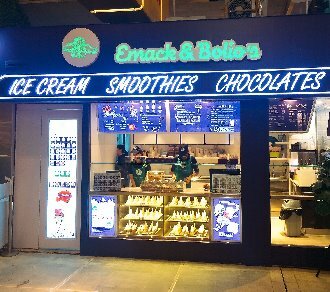 We think great ice cream and great music are as popular today as they were all those years ago which is why we’re thrilled to bring Emack & Bolio’s to Hong Kong.